Rye is wheat's more nutritious cousin. It's high in fiber and low in fat, and is low on the glycemic index. Although similar to the wheat plant, the taste and color are completely different. 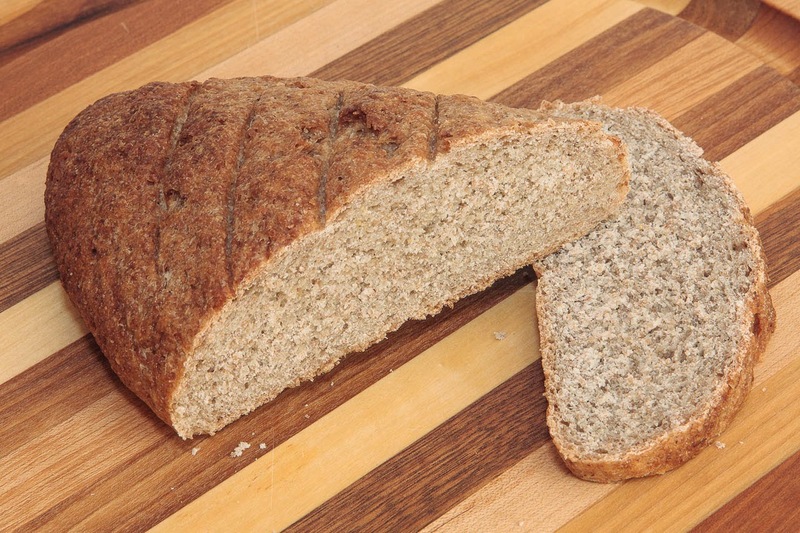 When making rye bread, you can completely change the outcome by the proportion of rye to wheat flour. This is a traditional rye bread, using at least 50% rye flour. It's a very simple bread to make, with only a few simple ingredients. 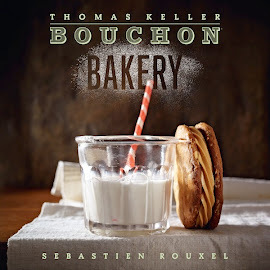 It also is the quickest bread to make in this book, with only a 30 minute fermentation and an hour of proofing. 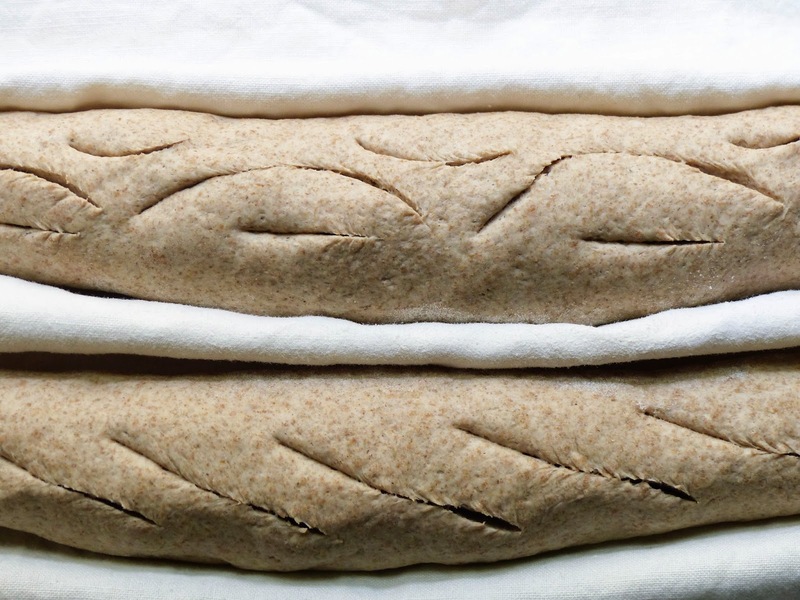 This dough does not require multiple folds or shaping, so it might be a good introduction to bread-making for a novice baker. Although we traditionally think of rye bread with caraway seeds, Bouchon omits them. It varies from country to country, so we are keeping with the French style. The end result is flavorful and perfect for a slathering of butter or a sandwich with spicy whole grain mustard. I've never been a fan of rye. If there was a bread basket at the table with ten different kinds of bread in it, I'd always reach for the whitest slice. However, after last week's delicious whole grain bread, I'm beginning to appreciate the merits of brown breads. I used dark rye flour for this recipe. The instructions say that it is a delicate dough, and it certainly was. The dough did not form a ball around the hook while mixing. It looked kind of goopy and not very pretty. But, I continued on, using plenty of flour on my board. The dough was actually not difficult to work with at all. I shaped it and scored it and let it proof. I scored one with slashes and one freestyle. This is the first time I've easily and successfully managed to transfer the unbaked loaves onto the baking stone! They just slid right on, no problems. I'm not sure if I've just gotten better at it or if this dough was just easier . The loaves baked up super brown and crisp, much darker than past breads, but that's to be expected. The crust was hard and the insides were soft and fragrant. The taste was a little bitter, but not unpleasant. Eaten warm with a pat of butter and a bit of fleur de sel, the first slice was delicious. Even more delicious I suspect is the sandwich in the book, with mustard, french ham and cheese. I'm saving a bâtard in the freezer for just that purpose. Although, since this bread took only about 4 hours from start to finish, it would be easy to whip up anytime. PS- a note on my starter. It's been super warm here in San Francisco this week, which made my kitchen very warm as well. My starter has been very liquidy all week, as the yeast is eating through its food quicker than usual. I tried to counteract that by using cooler water, about 70-72 degrees, but I think it just needed more frequent feedings. I couldn't notice a significant change in flavor, but it's possible the rye flour masked that. I have had so many wonderful rye breads while traveling in Germany. I keep looking for a recipe that might stack up to what I’ve had in the bakeries over there. Sadly, this is not it. It just turned out too dense, as with most of the recipes I have tried. My suspicion is that it might be the flour. 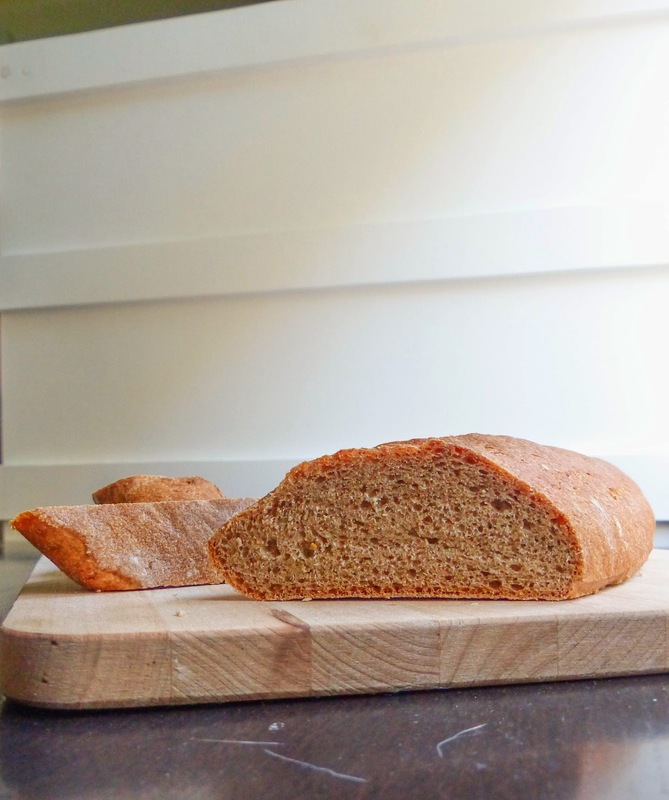 I have been using a stone ground rye in all the recipes, including this one. It is the only type of rye flour that I can find in the grocery stores around here. I wish I could find a finer grind. Once I ordered some white rye flour from King Arthur and when I used that flour, my bread had a much better texture. This recipe doesn’t seem to specify the type of rye to use but I think it might be better with a finer grind than stone ground, or perhaps I will try it with the white rye. It is expensive to order flour through the internet. I wish I could find a store that carried a white rye, or a fine ground rye. This stone ground stuff just makes for a dense loaf, and the dough was so soggy and sticky. Not much fun to work with. I am interested to know what type of rye everyone else used and whether they thought it was dense as well. Just got the book so I was delighted to find your blog. Congratulations on nearing the end of your baking journey! 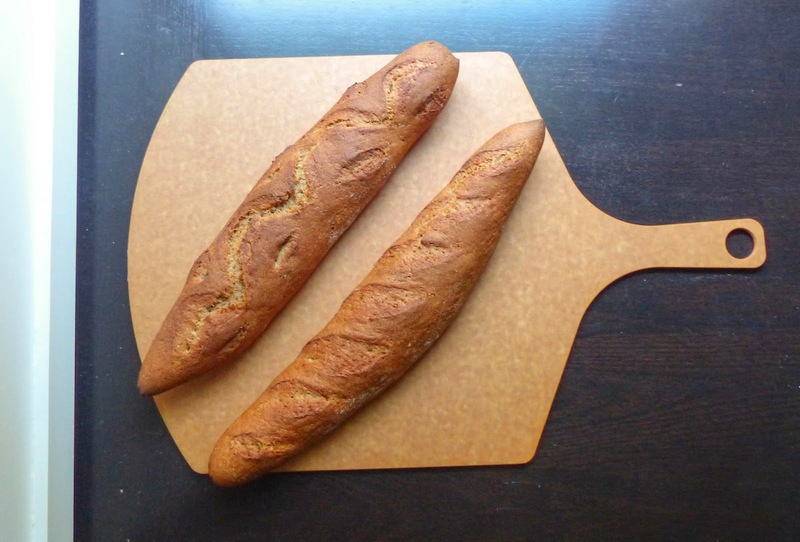 Last week I tried the baguette recipe (so-so results but I'm new to this). By chance I had just made the rye bread today. I'm pleased with them but the loaves are baguette size - now I'm wondering if making one loaf instead of two would work, like traditional sandwich bread.